Those who are considering a merry jaunt along the coast as a participant of the local fishing tournament should first make sure that their fishing level is of 16+ at the very least, guaranteeing that you can catch all the possible fish during the course of the competition. You can register by opening the event UI (either U or O button), or by interacting with fishing NPC’s at the main cities of Nuanor (Sulan, Sidus Ur, etc.). 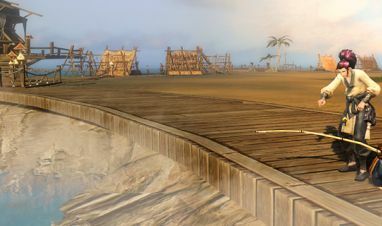 At 20:00, the fishing competition will start at Angler's Atoll – locate the registration NPC to be teleported directly there once you are ready. During the event, points will be awarded depending on the fish that you’ve caught. Mysterious Fish: random effects (20 points, +10 meter range, +100 sensitivity, or +100 occlusion). These fish are extremely rare. NOTE: Automatic fishing mode will only catch baby fish. The other 3 fish must be caught using the manual option. The Top 100 participants will receive rewards based on their rank. In addition, once a player obtains 30 points, they will receive a fishing participation reward that contains: experience, 1 treasure chest, and 3 fishing books – making it a worthwhile venture even if you are not competing for the coveted No.1 spot. Regardless of whether you enjoy it as a relaxing and rewarding hobby, or are vying to conquer the fishing tournament and be hailed as the best fisherman of Nuanor, the tournament welcomes you. There is no shortage of fish in Nuanor – learn how to land your first whopper and prepare for the fishing tournament!